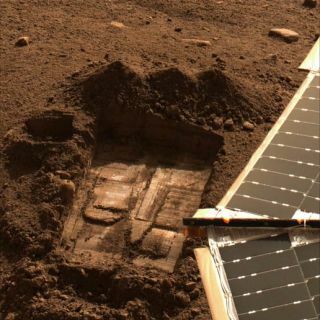 The Mars Phoenix mission dug into the soil of Mars to see what might be hidden just beneath the surface. Samples from this trench were delivered to the Wet Chemistry Laboratory, which was part of Phoenix's Microscopy, Electrochemistry, and Conductivity Analyzer (MECA). Thefirst and only attempts to search for life on Mars were theViking missions launched in 1975. Now scientists are suggesting thenext decadeof robotic probes sent to the Red Planet should make the search forlife thehighest priority. Afterthe Viking missions, the general consensus was that cold,radiation, hyper-aridity and other environmental factors ruled out thechancesfor microbial activity on or near the surface of Mars. This assumption? basedlargely on how Viking?s instruments did not detect organic compoundsthat wouldhave indicated Martianlife ? has been reinforced by each follow-up mission sincethen. TheMars Science Laboratory, scheduled for launch in 2011, isdedicated to searching for evidence that the Martian environment wasoncecapable of supporting life on the Red Planet. However, some scientistsarguethe strategy for Mars exploration should center on the searchfor life itself ? "extant" life that is either active todayor isdormant but still alive. "Thereis no human task more significant and profound than testing if we arealone ornot in the universe, and Mars must be the first place to look, as it isjustfacing our front yard," said astrobiologist Alberto Fairen at the SETIInstitute and NASA Ames Research Center. "Finding lifeon Mars would be the most important scientific achievement ofthiscentury." ThePhoenix lander spotted magnesium perchlorate in the soils,which can destroy organic residues. This discovery has causedscientists torethink the Viking assumptions. Because Viking heated its samples, itcouldhave caused a chemical reaction between perchlorate and any organicspresent,thereby destroying the organics. Therecent detection of methane on Mars has also revived thepossibility of past or even extant life just below the surface, sincelife isone of the primary producers of methane on Earth. Ashostile as Mars might be for life, numerous examples exist oflife surviving in extreme environments on Earth. For instance, microbesareseen in cold, dry soils of the Antarctic Dry Valleys. Thesesoils are arrangedinto a layer of dry permafrost overlying ground ice, a structuresimilar tosome soils on Mars. Debris-rich ice layers in glaciers trap water filmsandmineral dust that can serve as a basis for life on Earth, and similarlayersare seen at Mars' northern polar deposits. Microbeseven live in salt knobs in the hyper-arid Atacama Desertin Chile, which is often described as similar to Martian soils. Theseanalogs of Mars on Earth suggest there are relatively few areason Mars that could support life ? ice-cemented ground,massive ice depositsand certain porous salts. "Probeshave been sent to regions of Mars where ice-cementedground is common ? this was the case of Phoenix, in the northernplains,"Fairen said. "Other environments, such as hundreds of regionalaccumulations of chloride salts, have been discovered very recently,only threeyears ago, and are dispersed on the ancient southern highlands. In anycase, therehave been no attempts to analyze any of these environments with modernbiological instruments to search for life, extant or extinct." Fairenand his colleagues recommend a new strategy for the next decade ofroboticinvestigations on Mars, one in which the search for extant life is thefirstpriority. "Wecall for a long-term architecture of the Mars Exploration Program thatisorganized around three main goals in the following order of priority ?thesearch for extant life, the search for past life, and sample return,"Fairen said. Theresearchers envision probes targeting the kinds of areas wherelife might be found, and carrying instruments that can provideindisputableevidence ? such as actual microbes ? for the presence or absence oflife.Robotic missions in search of spores, dormant life or organic remainscould,for instance, drill a few yards down to reach ice-rich layers shieldedfrom thehigh levels of radiation at the surface and use microscopes to examinetheir finds. Amission aimed at looking for extant life would also be ideal forfinding any extinct life, since dead organisms likely would be found inthesame places as live ones would. Since soil bacteria in the AtacamaDesert arespread out in a patchy manner, any new missions to search for life onMarsshould incorporate a rover. Landers should also be used to returnsamples, ifat all possible. "Thetechnology is ready," Fairen said. "We onlyneed a new impulse and more ambition." Thescientists detailed their strategy online Oct. 7 in thejournal Astrobiology.